Over at the Bundle of Holding they are in the last hours of a bundle full of great indie female game designers. At the time of this post (18 hours to go!) they had only sold 554 bundles. This is criminally negligent on the part of the tabletop gaming community. Click through on that convenient link and get some great DRM-free gaming PDFs for your gaming collections. For the base price of $9.95 (US dollars, of course) you get three great games: Awesome Adventures by Willow Palecek (a streamlined hack of the Spirit of the Century SRD), Cogs, Cakes and Swordsticks by Lynne Hardy (a game of Steampunk adventure in Jolly Old England) and Tragedy In Five Parts by Michelle Lyons-McFarland (a Shakespearean role-playing game). The retail value on these PDFs would be $30, but through the Bundle of Holding, you can get them for a third of that. But! The fun comes in when you sweeten the pot and go over the base price. If you bid over the threshold amount (just over $20 at the time of this post) you will get an exciting variety of other RPGs as well. Another Fine Mess by Ann Dupuis is a classic adventure for the Fudge RPG that allows to you play animal characters. Blade & Crown by Rachel Kronick combines the faux realism of 80s fantasy adventure RPGs with the narrativist sensibilities of indie RPG design. 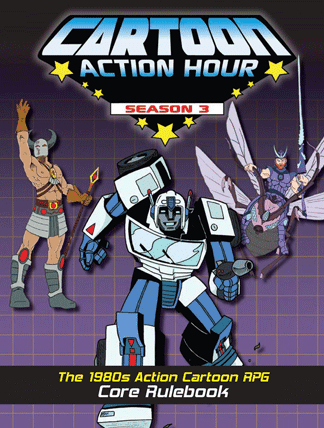 Cartoon Action Hour by Cynthia Celeste Miller takes you back to the days of your favorite Saturday Morning Cartoons of the 80s. Monsters & Magic by Sarah Newton combines old school gaming with new school approaches into a fast and fun fantasy roleplaying game. 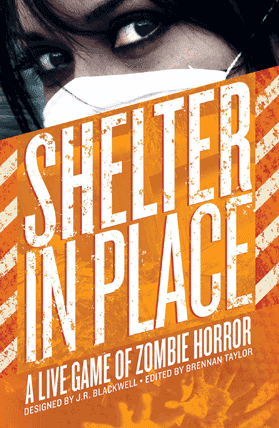 Shelter In Place by J. R. Blackwell is a live action role-playing game of zombie fun. Steal Away Jordan by Julia Bond Ellingboe is an exploration of slavery. Not for everyone, but it is still an intriguing game. Why should you support a bundle like this? Two reasons. First, the games are cool, interesting and fun. Second, diversity is always a good thing. Gamers can get locked in their ways and only play the same games, sometimes for decades. Consider getting exposed to new outlooks like the Five Year Mission of the Enterprise and "explore strange new worlds, to seek out new life and new civilizations." You might find your next favorite game if you look around. Pinnacle Entertainment Group has a new Kickstarter running for their new sci-fi Savage Worlds setting, The Last Parsec. With the new Kickstarter comes a press release that details some information on the game, the Kickstarter, and includes links to more information. Those already interested will likely enjoy looking at this primer PDF for The Last Parsec that goes into a little more depth on the setting and races available. Of note, The Last Parsec will require the Savage Worlds core rules and Savage Worlds Science Fiction Companion to play. After a brief pause, +David Rollins gives up some opinions on Little Wizards, an all ages fantasty RPG from Crafty Games. There is also a free preview available of the game on RPGNow. Another Gen Con has come and gone and as the dust settles down on this year's ENnie Awards you may be sifting through the winners looking for gold, but if you are a parent looking for a good RPG to play with your kids you should be looking at one of this year's nominees. Little Wizards from Crafty Games was nominated for the Best Family Game ENnie and while it did not win, it is worth considering if you are looking for a quality RPG to share with your kids. The layout works well on multiple formats. I read the the pdf copy I received for review on my laptop, my desktop and even my phone. The two columns on square pages worked well on a wide screen and the columns fit easily on my phone screen so I could read a half-page at a time with no trouble. I also printed it out so I could get a feel for how the art worked in the book form. Arnü West's illustrations are brilliant, with plenty of action in every scene depicted. It's clear at a mere glance that this game is all about young wizards doing cool stuff. West's style mixes the familiar with the fantastic to open up a world that is both magical and comfortable for a brand new player. Some of the choices West makes, such as the viewpoint and the form of the buildings, reminds me of illustrations from old copies of Peter Pan which gives everything a classic feel. The mechanics of the game are based on a roll of two, six-sided dice. The player rolls and adds a trait to meet a target number based on difficulty of a chosen action. That much is familiar to most gaming parents but there are some innovations that encourage a certain type of play. Traits are rated as Good (+0), Better (+1) or Best (+2). No character can be the best at everything so the players will need to work in teams where everyone has an important role to play. There are also rules for cooperation that allow other characters to help, so players only need to come up with a reasonable way their characters can contribute to start stacking up +1s on their friends' action rolls. Character creation is easy, with a handful of choices and random tables that players can roll on, choose from, or simply use as inspiration. My daughter had a great time rolling up her Little Wizard's personality with the tables. The Magic system is open-ended with plenty of room for players to get creative to use their magic to solve problems and plenty of suggestions and examples to help them along as well. There are different types of magic so again, teamwork is emphasized in the design. There are no hit points or health in this game. If a character gets hurt it becomes a problem that needs to be dealt with. The violence in the game is on par with what you would find in a cartoon program like Scooby Do or My Little Pony so it's not likely that the players will find themselves dealing with character injuries often. My favourite part of this game is the setting! It's wonderful how the original french author, Antoine Bauza, and the english language developer, Amanda Valentine, managed to blend so much of my favourite fantasy fiction for young readers into Coinworld. I see echoes of Ursula K. LeGuin's Earthsea in the Archipelagoes and the role wizards occupy as problem solvers. Terry Pratchett's Discworld shines in the shape of Coinworld and in the types of magic. A game about young wizards can't escape comparison to J.K. Rowling's Harry Potter series and it certainly shows in much of the visual aesthetic and technology level of the Little Wizards setting. Coinworld is a disc with two sides, a light side with mischievous creatures like fairies and a darker side with monsters like goblins and vampires. The two sides are a mirror of each other, with each cluster of islands forming an archipelago that has a counterpart on the other side of the world. These archipelagoes have their own personality and features. What I like is that they are described in broad strokes with a few paragraphs of basic description and what kind of adventure would likely happen there. The more detailed descriptions of the archipelagoes come at the end of the book in the three sample adventures. Each adventure gives a little more detail about its location in the introduction. This choice implies that the world is not really defined until the characters actually visit there. This sand-box approach is a great way to get your kids used to the old-school style of play. The sample adventures give players and new “Narrators” a great place to start and plenty of hooks for adventures to have after each of the ones provided. mind style play without maps or miniatures. My youngest daughter is a visual learner so the games with paper miniatures tend to hold her attention better than this style of game. My oldest, on the other hand, is an auditory learner so this game turned out to be a great fit for her. I found it to be more of a feature than a drawback because I prefer the theatre-of-the-mind style of play to maps, grids and miniatures but it is something to consider. 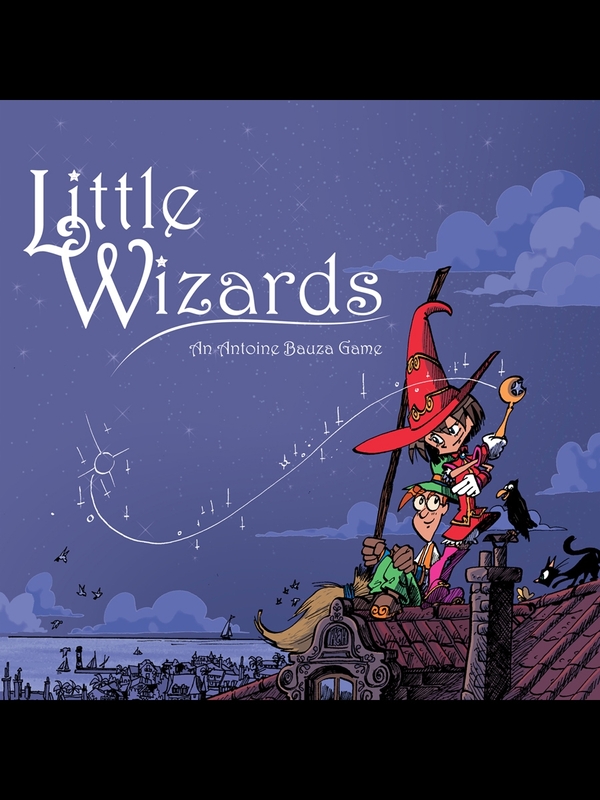 Little Wizards is a wonderful table-top role-playing game to play with kids. It's a great introduction to the game and has a decent experience system so it can work well for long term play too. I like that the material that it draws on for inspiration doesn't force the same old fantasy tropes and assumptions on new players. They are offered a new world to explore and make their own. If that sounds good to you, head over to the Crafty Games' website to find out how you can get your copy! A panelist on the Geeky Voices Carry podcast, +David Rollins talks about gaming, fantasy fiction and other interests of his across social media like Google+. David also plays games. A lot of games. 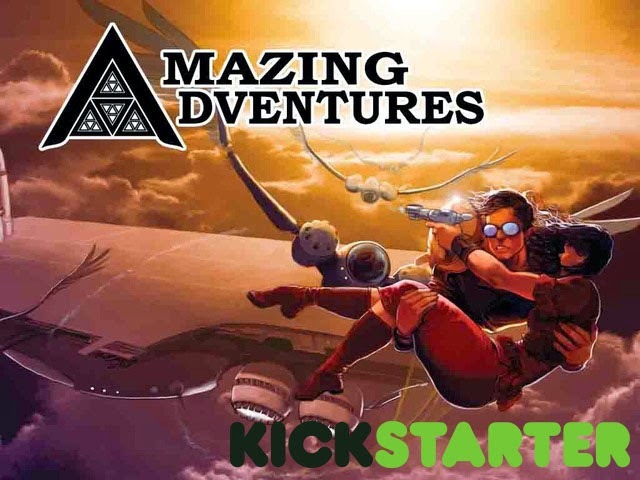 The Amazing Adventures RPG Kickstarter is entering its last week of funding. Troll Lord Games' SIEGE engine-powered pulpy RPG has already met and surpassed its funding goal and is starring down another stretch goal. During this busy period, we here at Dorkland! got a chance to sit down with Jason Vey, author of Amazing Adventures, for an interview. Dorkland! : You're no stranger to Kickstarter -- what have you done differently, if anything, this time around? What do you feel has really been key to your quick funding? Jason Vey: Honestly, this is the second Kickstarter I personally have been involved with, but the last one was for a different company which pretty much handled everything. On this one, the Trolls are keeping me very involved, asking for ideas to help push it, having me help with the marketing, answering comments from supporters, and the like. DL: Apart from the hardcover edition of the book(s), what else is the Kickstarter aiming to do for Amazing Adventures? What all might be of interest to current owners of the softcover edition? JV: Well, this isn't just getting the book in hardcover. We're doing a complete cover-to-cover edit of the core rules. That means incorporating errata, expanding and clarifying things, adding a few additional options, giving a character class or two a facelift, and re-expressing the rules so that they read more in line with Castles & Crusades, to increase compatibility between the two games. DL: What are some of the inspirations behind Amazing Adventures? What kind of pulp can potential players expect? JV: What I wanted to do with this game was provide a framework to model ANY sort of pulp. If you want to do an Indiana Jones type game, the rules are there. If the Rocketeer or Sky Captain and the World of Tomorrow are more your bag, you can do it. If you dig The Shadow, there's rules for that type of character. If H.P. Lovecraft is more your thing, we've got Lovecraftian horrors and a madness system in there. If you're into Philip Marlowe hardboiled detective noir, go for it. My inspiration for this was not pulp in the strict, two-fisted way many games portray it, but pulp in terms of every sub-genre that appeared from the Dime Novels of the 1880s all the way through the sci-fi of the 50s and into the movies and stories that were inspired by them today. DL: What seperates Amazing Adventures from other pulpy RPGs? JV: Like I said, I think it's the breadth of possibilities. Most pulp games focus on high-flying, two-fisted adventure and neglect the horror, noir and sci-fi elements of pulp to a certain degree. This isn't true in all cases, but certainly there's a lean towards two-gun heroes in pulp RPGs. I wanted AA to be more broad in scope than that. DL: What might interest fans of pulp stories that are not currently avid gamers? How easily might they be brought into Amazing Adventures? JV: The SIEGE engine that powers Amazing Adventures and Castles & Crusades is so easy to use that it's an ideal engine for new gamers. The system is easy to grasp, fast and fun to play, and gets out of the way to let you focus on the game. I think most fans of pulp dream of telling their own stories of horror, weirdness, adventure, noir, sci-fi, or whatever their preferred sub-genre is. Role playing allows them to do exactly that, and Amazing Adventures is a perfect means by which they can get into the hobby and give it a try. DL: Amazing Adventures has guidelines on how to run a pulp game -- how in-depth are they? How much background does a potential player need to run or play, if they have little to no experience with pulp? JV: The book contains everything you need to get up and running, and in the second printing, I'm expanding the Game Master section even further for extra detail in structuring and running a pulp game. With the core book alone you have everything you need. The Manual of Monsters and Companion books, however, will blow the doors off the system and take it to unbelievable levels by greatly expanding what's already there and giving you new rules for everything from sub-genre emulation to expanded vehicle rules to mystic locations and even live action rules. I'm really excited to get the second printing and sourcebooks out there and see what people think! DL: Lastly, what are some of the most 'amazing' moments you have had with Amazing Adventures? The kind of moments that really highlight why people should buy and play this game. JV: Man, it's the players and characters that make the game. Some of my favorite moments have actually been con adventures I've run. I'll never forget a group I ran that had a vampire trying to get an ancient bible of an evil cult away from the PCs, and one of the players was playing Marie Laveau. Her strategy was to start stabbing the book and running around in circles while the vampire chased her and everyone else took pot shots at it! That probably doesn't read quite as funny as it played out, but trust me: there were tears of laughter in the eyes of everyone at the table. We also, in the same group, had Bucky Newson, the Gadgeteer, try on a lie detector he'd designed, only to have it fail spectacularly to the amusement of everyone present. There were moments of great heroism as well, like when a group's raider, Tennessee O'Malley, went toe to toe alone against an angry Succubus...and not only survived, but sent her on the run. Some of these things are actually made possible by the character customization rules in Amazing Adventures. Unlike most class-and-level systems, we incorporate the ability to customize your character class with things like backgrounds, knowledge skills, and Generic Class Abilities, which you swap out with standard class abilities to make your character different and unique from other characters of the same class. In addition, Fate Points are a mechanic that's fairly well known, which we incorporate to allow for turning failure into success, or success into wild heroics. I could gush about the game for pages and pages. I'm really proud of this game, probably moreso than anything I've done in my 15 years in the industry. But my hope is that people will take a look and fall in love with it for themselves. Even if you're not a fan of class-and-level systems, I think Amazing Adventures may be an exception, due to the incremental way the SIEGE engine scales. We here at Dorkland! would like to thank Jason for his time in answering our questions. For more book-stabbing and lie detector mishaps, be sure to check out the Amazing Adventures RPG Kickstarter page and Troll Lord Games' website! I love getting mail. Really, who doesn't? I particularly love getting mail when it contains some cool gaming stuff like this little boxed set from the fine people at Troll Lord Games. I saw this box while I was at Gen Con, but I was more focused on other releases from the company (as well as talking about their then-upcoming Amazing Adventures Kickstarter with them) to give this a look. I wish that I had given it more of a look. The Castles & Crusades Black Box is a limited edition supplement for Castles & Crusades to commemorate the game's 10th Anniversary. The black box is only being released in a run of 1,000 copies, with the first 300 being numbered (inside of the lid of the box) and containing a signed plate. What's in the box? Well, that is where it gets interesting. For me the most interesting of the three booklets in the box would be the Adventurer's Backpack. Why? 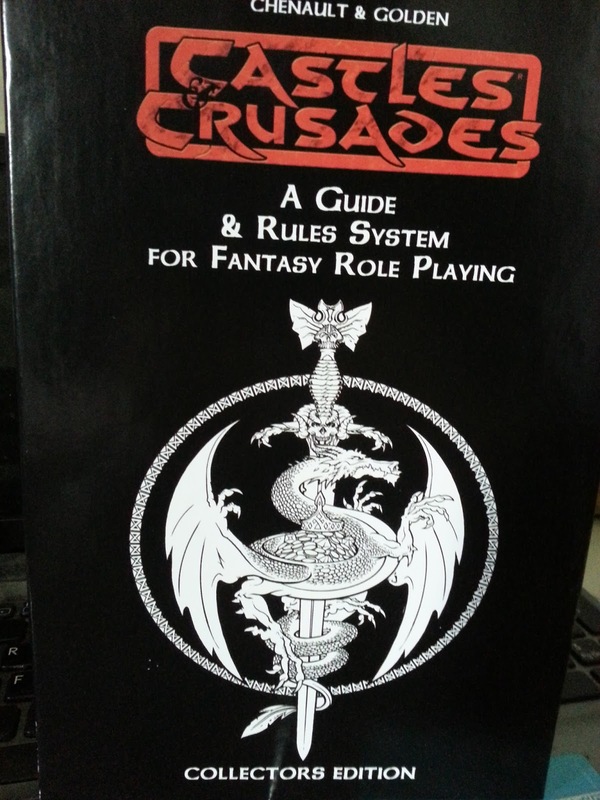 Because it contains four new classes for your Castles & Crusades game, based on the familiar fantasy gaming archetypes but taking them into new directions. These new classes are Archer, Avatar, Thief and Magic-User. Yes, a couple of the names are familiar, but these classes take things into different directions with them. The Archer is like a fighter, but obviously based around the bow. I have to admit that the first thing that I thought about when I read through this class was Horsewoman from the DC Comic Demon Knights. Anyone who thinks that archers are going to be wimps have obviously never read that comic (and if you haven't I am sorely disappointed in you). The Avatar is the cleric analog in the rules. Rather than giving a worshiper access to spell and abilities, like with the standard Cleric, an Avatar is a physical manifestation of a deity. This means that the Avatar is there for a specific purpose, to fulfill some goal or action of the deity manifesting in them. Obviously something big and bad is happening if an Avatar is getting involved in the story. Knowledge can be just as much of a special ability as being able to climb walls and sneak attack. This Thief represents that, from the noble with a larcenous heart to the pilfering servant. Anyone can pick a pocket, but not everyone can plan and pull off a heist...and know how to get rid of the ill-gotten goods. Finally is this new spin on the Magic-User. While they can cast spells like their brethren, this class is focused on detecting and identifying magic, as well as using and empowering magic items. A true "magic user." One thing that I have never liked about Magic-Users in the D&D-esque games (and one of the first things that I houserule in a campaign) is to turn "Read Magic" and "Detect Magic" into class abilities for the Magic-User. I've felt that these should be things that Magic-Users do from their nature and training. It is good to see that someone else feels that way too. The Adventurer's Backpack seems to hint at something new for Castles & Crusades in the future. Could it be time that the game is getting its own version of Unearthed Arcana? If these new classes are any indication of that I hope so. While I like the iconic in games, I also like being able to embrace the weird, and any supplement that will allow for that gets my approval. The Of Gods & Monsters Of Aihrde booklet is pretty much what you get on the tin. This talks about unique versions of some iconic monsters for the Aihrde setting of Castles & Crusades. There aren't actual game stats for anything in this booklet, just interesting discussions of gods and monsters, and a few tables. We get plenty of game stats for monsters, so it is good to see some character being investing in them as well. Rounding out the box is The Golden Familiar, an adventure for your C&C games. All of this for just $29.99. This seems to be available only through the Troll Lord Games webstore, so if you are interested in picking up one of the Castles & Crusades Black Boxes you will have to go to the link at the beginning of this post. Plus, there's dice. What gamer doesn't like dice? Get your copy before they are gone. 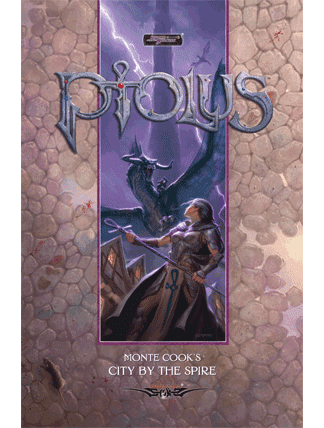 It is a good thing that a Bundle of Holding is so big, because it takes a lot of space to hold Monte Cook's Ptolus: City By The Spire. Arguably the biggest single shot setting for gaming (I don't really consider World's Largest Dungeon a setting), Ptolus comes in at more than 800 pages. For $19.95 you get the core book AND all of the following: the Chaostech supplement, the Banewardens and Night of Dissolution adventures, the first issue of the Ptolus comic and a couple of character journals. With the new edition of D&D rolling out, a lot of people are looking for settings for their games. Why not go for Ptolus? The conversion between 3rd and 5th editions look to be fairly minimal and you get a top flight setting that embraces the paradigms of 5th edition D&D, primarily exploration. You should get all of the setting you will need for a hundred campaigns out of this book. If you want to level up for the bonus material (which while cool isn't as compatible with the 5th edition rules), you only need to pay a few more dollars ($26.53 at the time of this post) you can also get the Complete Book of Eldritch Might, Books of Experimental Might I and II and Books of Hallowed Might I and II. You will also receive another adventure that you can adapt to your 5th edition games (Dark Tidings) and Secrets of the Delver's Guild, a series of articles originally written by Monte Cook to explore the world of Ptolus. So, for less than the cost of a copy of the Player's Handbook you can purchase the last setting that you may ever need and use it for your 5th edition games. This Bundle expires on September 16, 2014. What may be the funkiest tabletop RPG of the year (all years? ), Spirit of '77, is currently running a Kickstarter for the game. 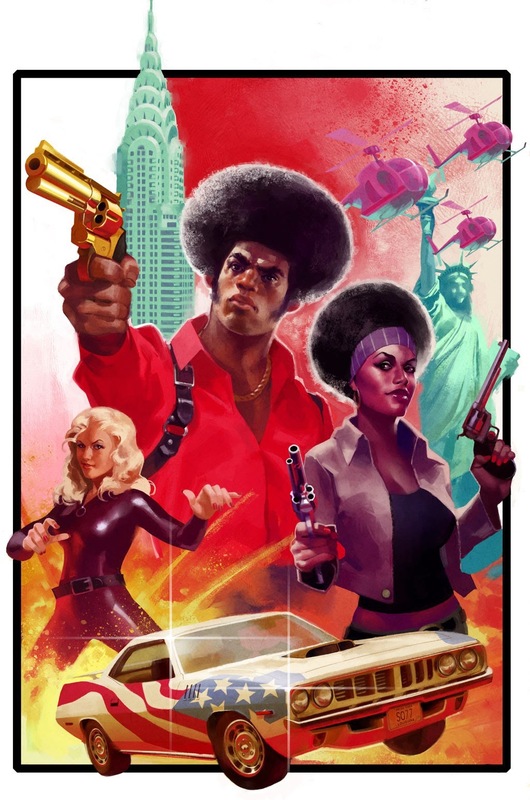 The '70s-themed RPG by Monkeyfun Studios is running on a modified version of Apocalypse World. For more information on Spirit of '77's rules and setting, please check out Monkeyfun's demo of the game on their website. Since Dorkland! has covered Spirit of '77 previously, I'll hop straight into the Kickstarter page -- and what a page it is. Needless to say, the project funded pretty quickly. The first thing you're likely to notice is the cherry red muscle car speeding away from an exploding backdrop -- very nice artwork that is interspersed during the explanation of the game. Other imagery includes explanations of the various pledge tiers, add ons, stretch goals, and the Monkeyfun Studio guys, themselves (done in-character, to boot). Everything is nicely explained. The information on the system is fairly simple, but also covers a decent bit to give the potential pledger a general feel for the game. The free demo (also linked to and easy to find on the Kickstarter page) goes into further detail, and allows the game to be trialed before pledging. Any pledge tiers, add ons or stretch goals that may require additional information have it included right below the imagery used for explanation -- and the information is italicized to further draw attention to it. In fact, just the general use of italics, bolding, bullet points, links and images throughout the page really help to break up and emphasize the information -- making it quicker and easier to process than most Kickstarter projects. The header video is done in-character and is fairly entertaining, as well as informative. It doesn't go terribly in-depth, but it gives a good impression of what the game is like. The biggest issue I have with the video is the audio -- it could have used some more editing and cleaning. That audio is really the only complaint I have with the Kickstarter, on the whole. For the pledging, US$20 will get you every digital product in the Kickstarter. US$25 will net you a physical copy of the core book (and its PDF), digital stretch goals, and a sticker (US-only option, UK/Canada and International folks have their own tiers, to cover shipping). And, lastly, the US$50 tier gets you all of the physical products (core book and expansion, PDFs of both, too), as well as physical and digital stretch goals (additional costs for shipping outside the US). Overall, the pricing isn't bad. The digital only tier is quite close to the physical core book, though, but it's a solid option for those living outside the US. And there you have it -- one of the best setup Kickstarter pages I've seen for a tabletop RPG recently, and a very funky RPG in-general. If you would like to know more about Spirit of '77, be sure to check out the Kickstarter page, Monkeyfun Studios' website, and their demo adventure -- The Cruise Ship of the Damned. Periodically I go through my YouTube channel (you can find a link to the right) and see what videos are the ones that people are watching. It is always interesting to see what people want to watch on my channel. Following are the five (in order) with the most viewings. A couple of years ago I launched an experiment in interviewing gaming people via the wonders of the (then new) technology of G+ Hangouts on the Air. I did these for a couple of reasons: to put faces and voices to the names that so many of us have seen on books over the years, and to help humanize gaming creators as well. When people are used to interacting with people through the text of books, or social media, they can start to see those people as just that text. Sometimes seeing a game designer or publisher in their home, or office, shows that they aren't all that different from the rest of us. Zak is a controversial figure for some, but he made for an interesting interview subject. Someday, I think that I would like to tackle interviewing him again. I love Cyberpunk 2020. I found the game while I was in college, back in the day when a lot of the elements of the game were still science fictional. It is a great game, and it has given me a lot of fun over the years. 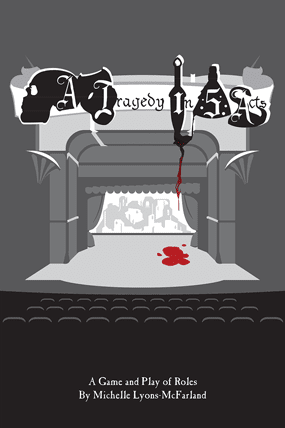 I ran a few episodes of it for some G+ people before scheduling fell apart. We took on the game as a sort of retro experience, much like playing Old School D&D. We didn't try to change or update the game, we just went for it. The group become a ring of "art terrorists" fighting against the corporations of the "future." It was a fun game while it lasted. I enjoyed this interview, even if I still can't pronounce James' last name properly. We talked a lot about our experiences as gamers back in the early days of the hobby. Both of us being about the same age, and having started gaming at about the same time, it was interesting to see how our experiences compared and contrasted. This was probably the last interview with James before all of the controversy around Dwimmermount. I know that's mostly why people have been watching the interview. There is still some good stuff in there, and it is an interview that I am proud of having done. I love Call of Cthulhu. One of the things that I had never had a chance to do was to run one of the big "megacampaigns" for the game. This was my hope. Sadly, scheduling caused the game to quickly fall apart. We still had a good time with this session. This session shows off the reasons that I enjoy the Call of Cthulhu game. One day I will run this campaign in its entirety. Hopefully. Ah, Rifts. I've been a fan of Palladium games since I found a copy of Ninjas and Superspies back while I was in college. I have a lot of their games, but the one thing that I have never had a chance to run has been Rifts. Things blew up fast, but that's cool because that is what Rifts is supposed to be. I would run Rifts again, definitely. Every time I see a new book for it, it makes me want to run the thing. We almost went for another Rifts game as the interim before we start playing D&D 5e, but Call of Cthulhu won out instead. Surprising, but it is a fun game. Really, I am surprised that the actual play videos have been as popular as they have been. None of us really expected that people would want to watch any of us sitting around playing role-playing games by Google Plus Hangouts. I have always been surprised that my Dorkland Roundtable with Monte Cook wasn't more popular. It does make me realize that I need to do more vblog posts on my YouTube channel, however. If you are into pulpy gaming adventures, there's a Kickstarter going that may help you realize your Rocketeer dreams. 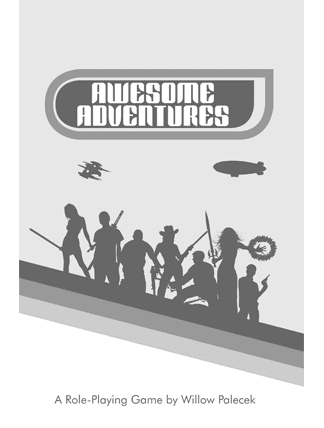 Amazing Adventures is an RPG by Troll Lord Games that utilizes the SIEGE engine (as seen in Castles & Crusades). The game has been out in softcover for a couple of years but this Kickstarter project aims to bring it a hardcover edition (and, with stretch goals, its supplemental books). And bringing that hardcover, it will, as the project has already surpassed its initial funding goal and the first set of stretch goals. It's now working its way through the next sets which include hardcover editions of the supplementary books, an adventure, and something secret. How is the Kickstarter project, in-general, though? I thought you'd never ask! Clearly, it has more than funded and that means the project has done what it needed to do. The information present is pretty condensed, which is fine, and it does give a general overview of Amazing Adventures and the project. I would have liked to see a bit more detailed information on the SIEGE engine rules or even a play-test/demo to check out -- that would be especially useful for new, potential players. The imagery on the page is only used for stretch goals, add ons, and shipping prices. While I am fine with having all of those (especially the stretch goal 'dungeon', complete with 'secret doors' -- that's creative), there really should be, at the least, more art showing off the pulpy aspects of the game. Something to really grab the attention and entice pledgers. The pledge tiers are done a bit differently than most projects, as the US$1 tier is used as a means to get the digital copies via add ons -- there isn't a purely digital tier. The first 'real' tier is at US$25 for the core book in print and digital. Then US$45 for the core book and the Manual of Monsters -- both print and digital. US$50 for the core book and the companion book -- print and digital. And, if you want all three, US$99 for the core, Manual of Monsters, and companion -- print and digital. That does not include international shipping, of which there is a chart to reference on the page. For the digital lovers out there, all three PDFs together are around US$49. If you would like to get your hands on this pulpyness, be sure to check out the Kickstarter page, and, for more information, be sure to check out Troll Lord Games' website. I'm not sure why the camera on my phone decided to read the bright orangeness of the cover to Crawljammer #4 as being a fleshy pink,but that seems to have happened. Perhaps my camera is trying to tell me that the new issue is pink and fleshy. I don't have an answer for that. I've talked before about Crawljammer over at Bleeding Cool. If you don't know what Crawljammer is...shame on you. Written with the Dungeon Crawl Classics RPG in mind, Crawljammer is a zine that has been developing and supporting a science fantasy setting for that game. Why the people at Goodman Games haven't snapped up Tim Callahan and put him to work on an official Crawljammer (or similar setting) for DCC is beyond me. In this issue you get all of the things that you expect out of Crawljammer: new classes, continual expansion of the setting and a mini-adventure. All of which is supported with top quality art. 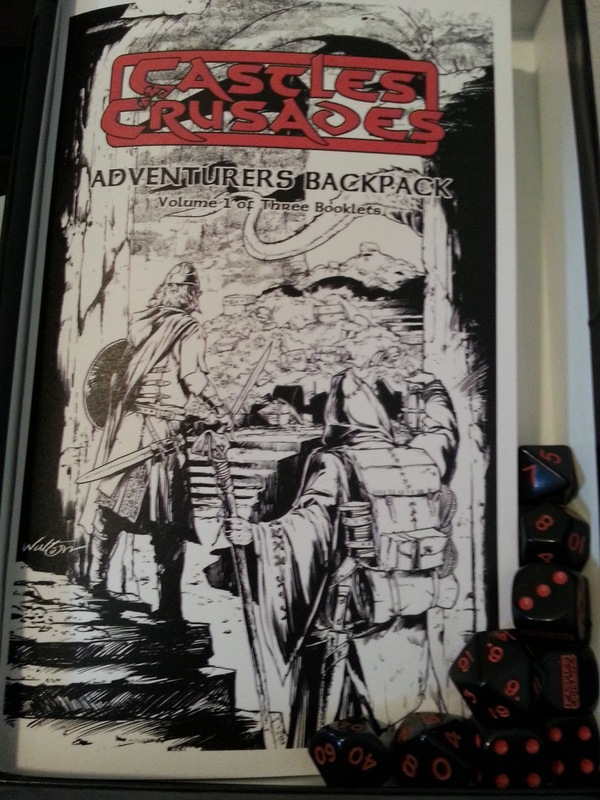 I don't play the DCC RPG myself, but that doesn't get in the way of this zine. The nature of most older edition emulators makes it easy enough to fit material from Crawljammer into your Swords & Wizardry or Castles & Crusades games. Space Pirates From Beyond The Grave, the mini-adventure in this issue, could easily be reskinned for your favorite fantasy game, if you don't play DCC or would prefer a more straight forward fantasy presentation. 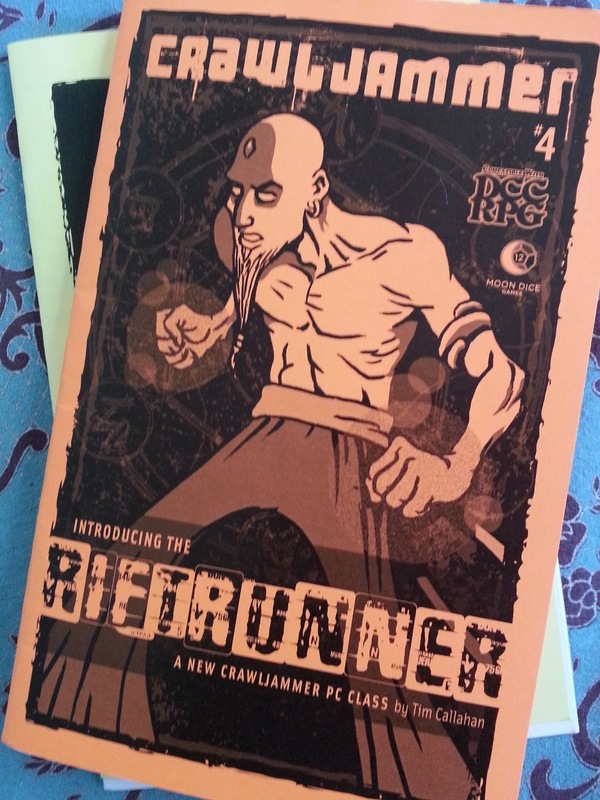 Crawljammer is a spotlight shining out of the RPG zine scene, and if you haven't tracked it down yet you really should. That puts us on to part two of this post. The second item from Tim Callahan that my camera decided to mute the colors. The actually yellow cardstock cover doubles as a map for for the Demon Drums adventure. Originally created by Tim to give out to people at Gen Con 2014, this adventure found its way into my mail box yesterday because Tim and I managed to not see each other while we were both at Gen Con. If you saw how big the convention was, you will understand. 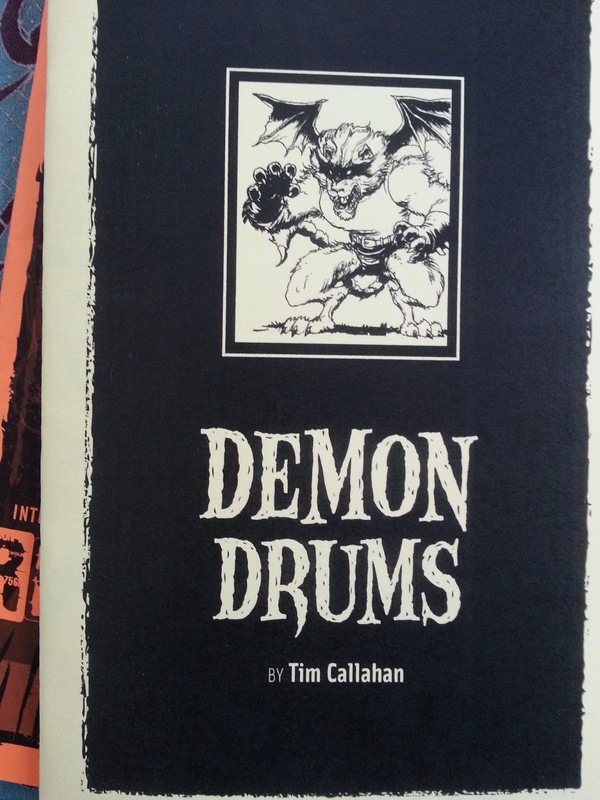 Thankfully, however, Tim had at least one copy of Demon Drums left and sent it too me (without my asking, which makes it doubly cool on his part). While not a huge adventure, Demon Drums is still exciting. A dungeon, the remains of vanished, ancient civilization, which is buried beneath a haunted tree in a dark and gloomy swamp? How is this not cool. What I like about Tim's adventure writing is that he takes ideas that could easily become stereotyped and elevates them into something that is more than the sum of its stereotypes. How again is it that this guy isn't writing official stuff for the DCC RPG? The great thing about this adventure (other than it being a great adventure) is the fact that it can easily be slipped into a rulebook and be used as the basis for a few hours of gaming fun with your friends. And, like with Crawljammer, you can easily use Demon Drums as an adventure in the game of your choice. If you haven't checked out Tim Callahan's work, you really need to do so now. There is a link at the top of this post to the Crawljammer blog, which is a glimpse into the mind of Tim, where you can order up the Crawljammer zine today.